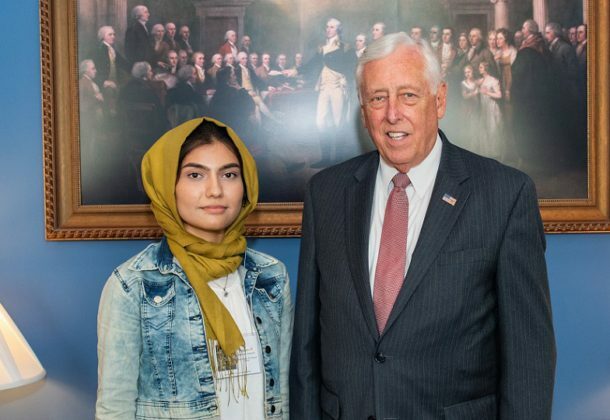 Congressman Steny H. Hoyer welcomed Fatemeh Hosseini to the US Capitol on June 28 to congratulate her on winning the 2018 Congressional District High School Arts Competition. Ms. Hosseini met with Congressman Hoyer and participated in events on Capitol Hill honoring high school students from across the country who submitted art to the annual competition. Fatemeh lives in Hyattsville, Maryland, and is entering her senior year at DuVal High School. Her artwork, titled “Children’s Blocks Still Life,” is a charcoal drawing of children’s blocks with various numbers and letters. The Congressional Arts Competition provides members of Congress with the opportunity to showcase the artistic talent of high school students in their districts. First begun in 1982, the competition has involved hundreds of thousands of students, and the winners have their pieces hung in the Capitol complex for a year, to be seen my the many visitors from across the country who come to the Capitol and by members of Congress every day. Each year, Congressman Hoyer sends letters to all the high schools in the Fifth District announcing the Congressional District High School Arts Competition. After all entries have been submitted, a panel of local judges from the education and business communities meet to determine the winner.